Zucchini Walnut Bars – meh. I have a beautiful cookbook I have had for several years dedicated to squash. However, I do not recall trying any of the recipes. 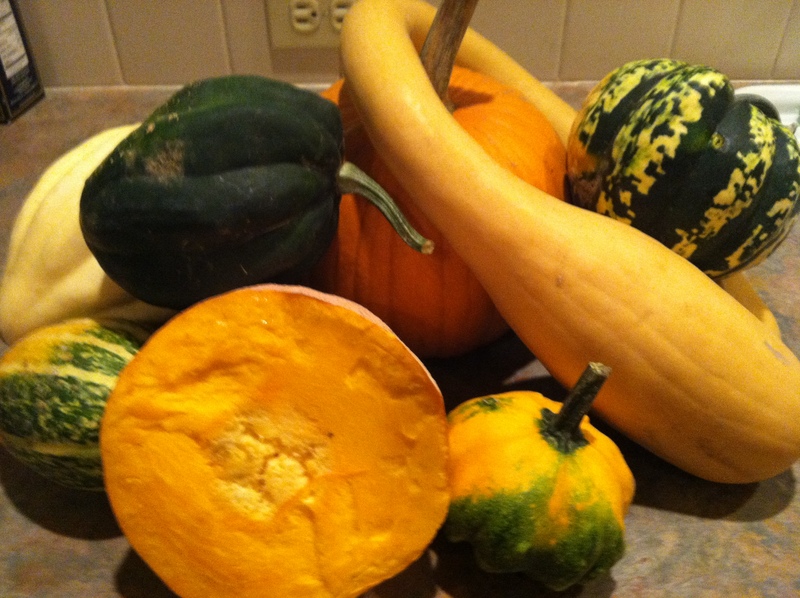 Now that I have a kitchen drowning in various types of squash, this is the time to seek its guidance. I thawed, drained and pressed the shredded zucchini (about 1.5 c). After pouring the batter into a greased 9″ x 13″ pan, I baked for 30-35 minutes until the cake was set and the top golden brown. The recipe called for cream cheese frosting and I thought we had part of a store bought jar of exactly that left over from a school bake sale . I apparently forgot the allure of a jar of frosting after school, and could not find my topping. I beat the ricotta to soften it, added the sugar and milk to form a smooth topping, then added about 1/4 t. sea salt and the vanilla. The book said it should be spreadable, but it was runny. I let it sit a while, then poured it on the cake after the cake had completely cooled. I’m not a big fan of confectioner’s sugar frostings, and this was no exception. It tastes like a sugar assault, but I thought the kids would like it, maybe. 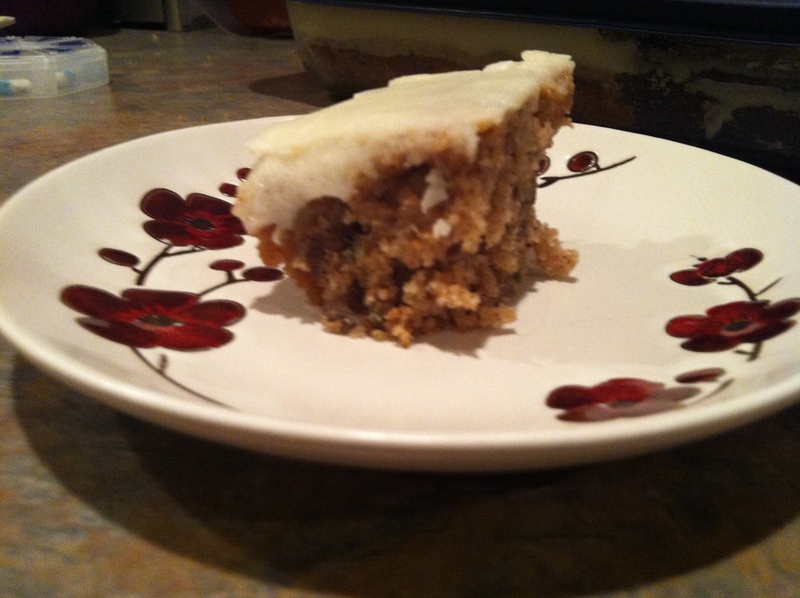 The zucchini walnut flavors were nice and delicate, but the cake was really dry and crumbly. Don’t get me wrong, we are obviously still eating it. We just describe it as our dry zucchini cake. I believe this is the bad that happens when I actually sort of try to follow a recipe! My daughter insists the solution is to add chocolate. This entry was posted in Recipes and tagged bars, dessert, frozen shredded zucchini, walnuts, zucchini. Bookmark the permalink. 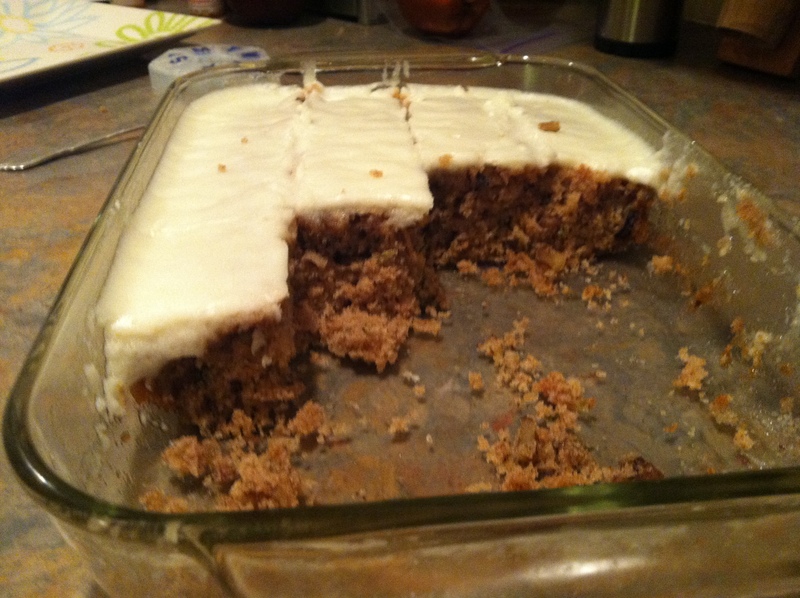 7 Responses to Zucchini Walnut Bars – meh. May I suggest that you should not have drained and pressed the shredded zucchini. There went your moisture. I freeze shredded zucchini a lot so my suggestion comes from experience. Your finished product looks fabulous!!! But the recipe TOLD me to press and drain the zucchini. I will make this again soon and try it as you suggest. 🙂 Thank you. I am similar in that I am not very good at following recipes…if it came out dry I would maybe try milk (coconut milk if going dairy-free) as part of the wet ingredients instead of all oil…but I guess the zucchini bread recipe I use doesn’t have anything but melted butter or oil (if going DF). I also do not press or drain the zucchini so that might be the solution 🙂 This look delicious though!! This sounds quite good. I hear ya about confectioner’s sugar frosting. I never care for it. Perhaps a chocolate ganache, in part because I like to say ganache and in part because I’ve got a Costco bag of chocolate chips I could melt to make said ganache. I’ll save this recipe to make with one of my freezer bags of zucchini! Oh. My. Did you get the Kirkland Signature chocolate chips or the Nestle yellow bag? I got the Kirkland Signature ones for the first time recently, and I’ve now made 3 batches of cookies following the recipe on the back and I am in love. I made a Whoppers batch using about 1/3-1/2 cup Whoppers (leftover Halloween) candies and the rest chips. I made a Twix batch using about 1/2 cup cut up Twix and the rest chocolate chips. Some lady at my spouse’s work bake sale came back and bought all of my cookies after tasting one! Then I made a batch using 1/2 cup of pecans, about 1/3 cup of dried cherries, and the rest chocolate chips. I am not that precise with the shortening, either, I threw in about 2-ish Tablespoons not the 2 2/3 tablespoons you ought to add to the butter. But my oh my that is a good cookie recipe. I did get the Kirkland Signature bag, but I haven’t had a chance to use them yet. Although I do see the kids have found them, so there may not be much left…..